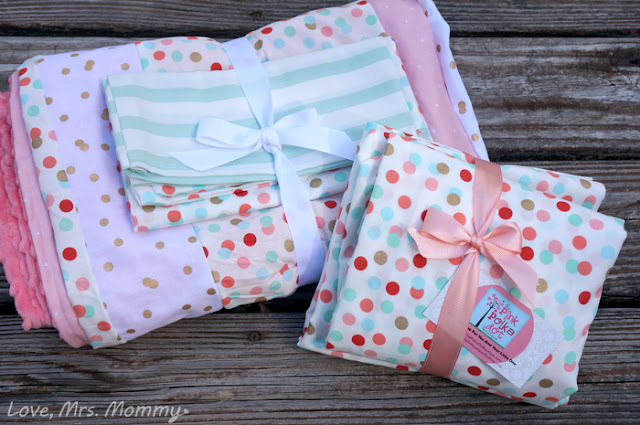 Love, Mrs. Mommy: Fashionably Cute, Customized Nursery & Baby Products by The Pink Polka Dot Boutique! Fashionably Cute, Customized Nursery & Baby Products by The Pink Polka Dot Boutique! I received a bedding set at no cost to facilitate this review. All opinions are my own. Decorating my daughter’s room has brought me a lot of joy. I love putting up personal touches around her room to make it an extra special place for her. However, since converting my daughter’s crib to an infant/toddler bed, we needed to do something about her sheets. It was time to get her a big girl set and I wanted something lovely, sweet and (of course) it had to have some pink! After all, this was for my very girly-girl. An extra special thank you goes out to The Pink Polka Dot Boutique for partnering with me and making my ideas a reality! The Pink Polka Dot Boutique has been creating custom nursery bedding and baby products since 2010. They offer everything from traditional baby bedding and nursery prints to new modern styles. You will be able to find all the essentials you need to get your nursery started and even grow with your child for many years to come! After browsing the wonderful variety of fabrics and products to choose from, I had an idea! I wanted to create a fun bedding set for my daughter that encompassed a variety of prints to make a shabby-chic inspired bedding set. Something fun and young, but full of style and big-girl flair. After making note of the fabrics I was interested in, I let Christine, (the creator and owner) work her artistic magic! As soon as everything arrived, I was immediately struck by the cute packaging and how all the colors and prints went together perfectly. She did a fantastic job of making sure that my choices did indeed all work together. You never know when you are looking at a variety of fabrics, and I appreciated that she understood what I was looking for and I trusted her judgment. And boy, did it work! 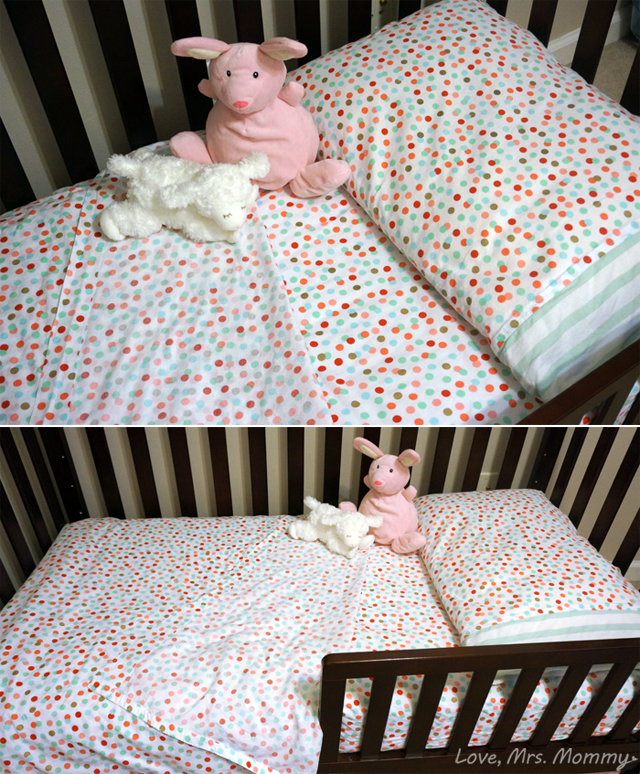 I received a beautiful bedding set that included a fun multi-colored polka-dot fitted crib sheet with matching blanket and pillowcase. 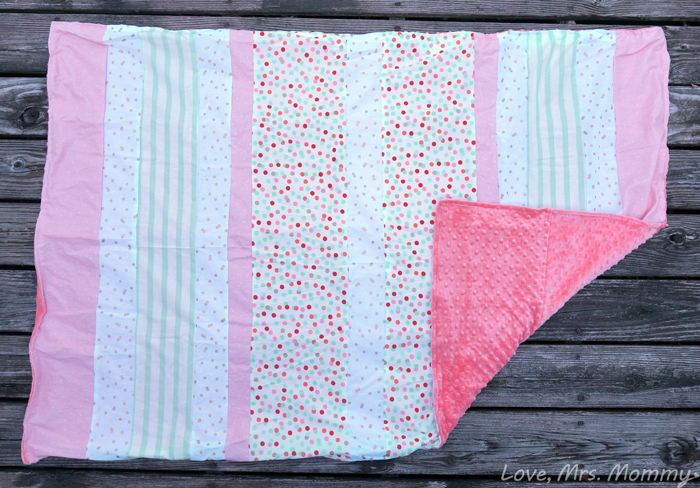 The pillowcase had the matching pattern as well, but the opening end had the mint striped pattern, which tied in perfectly to her adorable, shabby-chic blanket! The blanket is too cute for words and is very soft! As soon as my daughter saw it she carried it from where I took it out of the box and laid herself down on the floor and covered herself up! She said she was ready to take a nap… say what?! Haha, works for me! The blanket is made up of four different fabrics, which Christine cut in various widths and sewed them in a lovely pattern. The underside is an oh-so-soft pink minky that matches beautifully! Perfect for a snuggly night’s sleep on cold nights. As soon as my daughter saw her bed with her new bedding, she ran over and gave it a nice pat and kiss. It was so cute! She said… “Look at all those polka-dots… so many colors… it’s so pretty!”.. and she excitedly pointed out all the colors to me. She definitely couldn’t love it any more and I can tell she feels like a big girl having these beautiful new sheets and blanket. 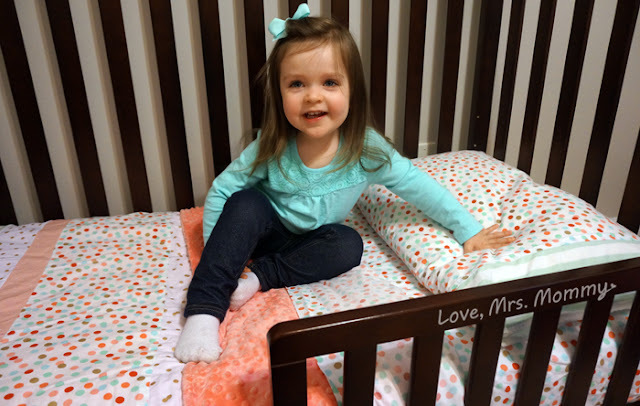 We have used this bedding set for a few weeks now and I can truly say that everything has held up great! They have all been through the wash, numerous times, and they haven’t shrunk or been ill-fitting afterwards. The quality is wonderful and we couldn’t be more pleased! 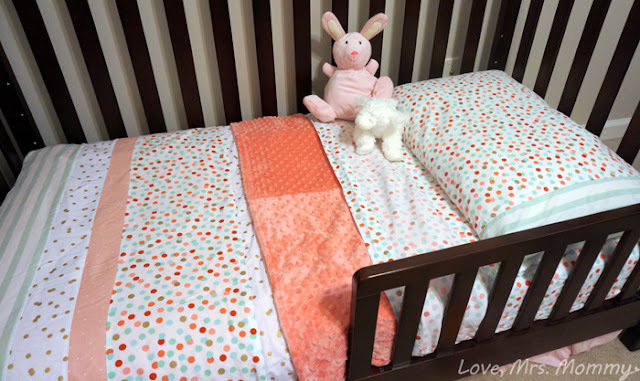 Next time you are looking to make a bedding purchase for your little one… whether it be for a new baby or if it’s time to redecorate, check out The Pink Polka Dot Boutique for your needs. It would be safe to say that they have what you are looking for! Connect: Find out more about The Pink Polka Dot Boutique by visiting their website. Then make sure you “like” them on Facebook and follow them on Instagram. Buy It: You can shop all the products they carry and their amazing prints to choose from here! This set is just so Pretty and your little Girl looks so pretty n them. Love it!! Omgosh its adorable!! I loove it!! Love the mixed patterns and materials!! So whimsical and cute! That print is precious! I would love that for my baby girl!